This rug is as advertised and looks great in my home. 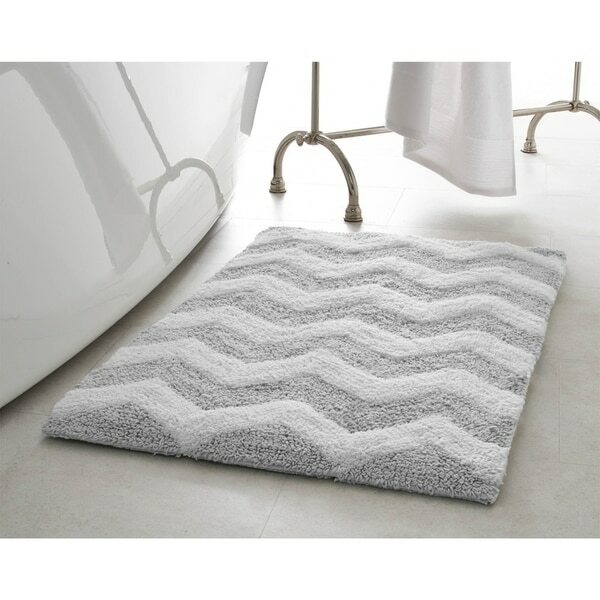 Add some pizzazz to any bathroom decor with this unique Jean Pierre 100-percent cotton bath rug. Featuring a stylish chevron pattern, this charming piece comes to life with alternating rows of loop and high-cut fibers in soothing bathroom-friendly colors. Very nice Bath mat. Very thick and absorbs well. The color was true to the description. I am fussy about things like towel sheets and all linens. This one did not disappoint. I would recommend this to friend or family. This is a well-made beautiful rug just what I wanted. The color is a light green with a white and green zig zag pattern which actually matches the shower curtain I purchased. It is perfect and modern looking. I was surprised to find that it has the pattern on both sides of the rug. Very tight knit yarn. I love this little rug, I bought the yellow, and it adds a nice pop to my bathroom. It is also a bit thicker, which is nice. The only downside - it is a reversible rug (which is great! ), but the tag particularly is on one side so makes it stand out when you have that side up. Though, I suppose I could trim it off. Plush and absorbant bath rug. Way thinner than appears in picture and not very plush either. Over priced too. Mostly White in Color and very light grey....take a pass on this one. I'm looking for a different one now.. So i am aware that colors can look different on a monitor but there is no way that the color they describe as blue is blue , also looked like poor quality but i just could not get past how off the color was. Color does not match the photo, its off-- I purchased gray bath mat, the item is light teal or greenish - its not the same color as on the picture. Also the quality is not the best. The product description was very accurate. The plush feel under my feet is great. The colors are crisp and bright. I'm very happy with this purchase. This rug is beautiful but a terrible bathroom rug. It holds water and when washed, the colors bleed. I can’t believe I paid this much. Don’t buy! POOR MATERIEL.USED FOR 2 MONTHS AND NEED TO GET A NEW ONE. This was a thick bath mat. The only issue is that the grey option looked more like a tan/light green mix. Looked everywhere for perfect powder room rug. This was it. Plush and perfect! I love these rugs! They are a great value for the price. They are as soft as they look in the picture and they fit perfectly with my laundry room decor. This picture is take in sepia color. The rug isn’t grey at all. It is taupe. Sending it back. Won’t match anything grey. Very thick and plush, washes well too. "Does the back have rubber on it? I have bath mats that have rubber and fall apart in washing machine. Thanks!!" The backing is 100-percent cotton, so rug grippers or a rug pad are recommended and sold separately. I chose this because it's reversible, thick and beautiful! However I did want size 24" x 34"...I'm certain I'll love it! I recently got the bathroom rug and just love it! I couldn't find the right size anywhere else. Thanks! Chesapeake Alloy Moroccan Tiles 2Pc. Bath Rug Set (21"x34" & 17"x24") - 21"x34" & 17"x24"